The 79th Pennsylvania was recruited, with the exception of one company, in Lancaster County. The regiment mustered in at Camp Wilkins in Pittsburgh, before taking a steamer to Louisville, Kentucky. In the spring of 1862 the regiment, part of James S. Negley's brigade, garrisoned Nashville and the 79th later garrisoned Columbia, Tennessee. Seeing guard duty at various sites in Tennessee, the regiment participated in the battle of Perryville and suffered 216 casualties. In January 1863, the regiment took part in the battle of Stones' River. The 79th participated in numerous engagements with William Rosecran's Army of the Cumberland and was present at the Federal defeat at Chickamauga in September of 1863, losing 215 casualties. 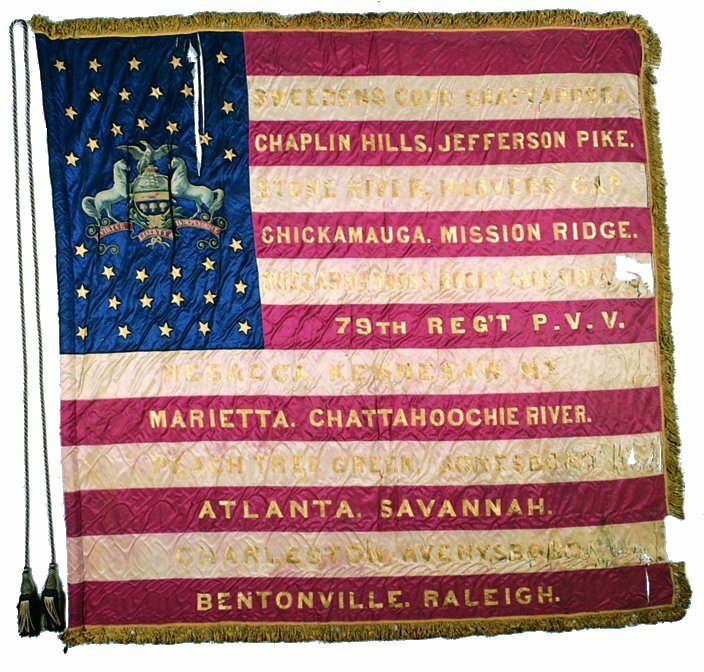 The regiment was granted furlough in March of 1864 and upon its return a month later participated in Sherman's Atlanta campaign in May. The 79th was along for the famous March to the Sea, assisting in the capture of Savannah, Georgia. It fought its last battle at Bentonville, NC and took part in the Grand Review in Washington, before being mustered out in July of 1865. The color shown is the regiments Second state-issued color and was produced by Horstmann Brothers Company in May of 1864. Source: Richard A. Sauers, Advance the Colors: Pennsylvania Civil War Battleflags Vol. I (Harrisburg: Capitol Preservation Committee, 1987), 214-216. The Pennsylvania Capitol Preservation Committee in Harrisburg has conserved and is custodian of approximately 390 Civil War battleflags for the state of Pennsylvania. The flag on this page is part of their collection which is available for viewing by appointment. © Flag images and text reprinted with permission of the PA Capitol Preservation Committee.